Hey guys, my name is Brian. Recently, we've been asked by a few of our clients to explain what IGTV is. IGTV allows you to create your own television channel using long-form video content—vertical, fullscreen—for over 10 minutes long. One of the unique things is you can create your own channel, watch other peoples' channels, follow influencers, follow friends, follow other companies—competitors—and watch what they're doing. It's Instagram's answer to YouTube. We cannot wait to see, over time, how companies, influencers, and individuals use this platform to create unique content. Brian touches on a few important points here. Not only is the novelty of IGTV exciting, but the possibilities of where IGTV is taking Instagram and social media marketing in general seem endless. It’s no secret that Instagram is soaring in popularity. Data from June 2018 found that Instagram hit a massive milestone -- one billion monthly active users. Wow. You can’t ignore the magnitude of growth of this platform. If you do ignore this, you’re already falling behind your competitors. In fact, Instagram’s 2017 research found that over 50% of businesses on Instagram published an Instagram Story within the month. That’s a huge shift in the way brands are executing their social media marketing strategies. So where do you start? First, you need to understand the basics of IGTV. There are plenty of video apps and platforms. Periscope, YouTube, Facebook, and the like are all viable options, but IGTV is a different world. The format is full screen and vertical, so it delivers the perfect mobile viewing experience. The time restraints are longer than Stories, allowing you to provide more detail and engage your followers in longer form video content. The autoplay function makes the viewer experience user friendly. For You - Curated channels that match your interests. Following - Video content created by brands and people you follow. Popular - Content that’s generating a lot of views and engagement. Continue Watching - Videos you started to watch that you can resume. This is still a very new feature within the Instagram world. Launched in June 2018, there are still plenty of options for growth and ways to evolve the IGTV experience. Expect to see a huge investment and big changes over the course of time. You will likely be able to add stickers, filters, and other fun graphics to your IGTV content at some point in the future. Plus, advertisers will eventually be able to create video ads within channels. This will probably include a ‘swipe up’ feature to drive viewers to landing pages and other resources in the conversion funnel. While it’s exciting to consider the future possibilities of IGTV, let’s focus on how to use it now, in its current state. Your main goal today is to start building your audience. Everyone can create an IGTV channel. All you need to do is record and save a video to your library on your phone, then simply upload it to your channel. It’s seriously that easy. This is good news because you can add video to your social media strategy effortlessly, but that also means there will be plenty of video content to compete with. Put the audience first: Record and publish content that is informative and specific to your followers and speaks directly to their pain points and challenges. Diversify your content: Posting the same kinds of videos to your channel will push away viewers. Consider how to make each IGTV post different. For example, share takeaways from a company event, showcase new products and services you’re launching, and present a behind-the-scenes look at your company culture. Make your channel unique: Unlike Stories, which is often informal, IGTV should be focused on delivering high value content. That doesn’t mean you can’t be fun; just ensure you’re giving your audience valuable insights and takeaways. 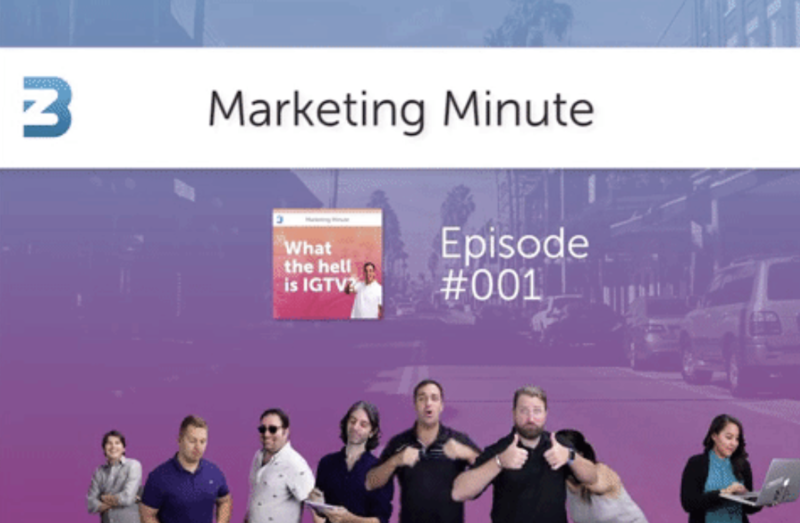 Subscribe to our blog for more helpful inbound marketing content, and stay tuned for the next episode of Marketing Minute!